SUPERMARKET giant Tesco has been served with a noise abatement notice on its Newmarket Road store. Residents claim they are constantly aware of the hum of fans on the site and are woken each morning at about 5am as a unit tied to the in-store bakery is started up. The problems were first brought to the attention of Cambridge City Council’s environmental health team in April last year, and have been ongoing since that time. The notice, served “recently” according to a Tesco spokesman, comes after the retail giant was denied crucial planning permission for a refrigeration unit for its proposed new Express store in the city’s Mill Road last week. Cllr Margaret Wright, whose Abbey ward includes the Newmarket Road Tesco, said: “Since I was elected in May I have had a number of complaints from residents about this and have brought them to the attention of the environmental team. A resident of Riverside Place spoke to the Newsabout the effect the noise is having on him and his neighbours. He declined to be named but said it was making life very difficult. The resident said: “All I want is to be able to sleep with my window open. Everyone is pretty ratty with the lack of sleep and it’s like living with the noise of a 747 frankly. “Not only do we have the constant hum of the cooling compressors on the roof, but we also have the fans linked to the bakery which come on at 5.14am each morning. “We’ve had the environmental health officer round to come and do testing and so have our neighbours, but it’s about the lack of respect Tesco seem to have had for the community. A spokesman for the Riverside Place management company confirmed the notice had been served. A spokesman for the city council said complaints had been received and the environmental health team was investigating them. Over the course of their applications for planning permission in respect of this site, and their appeals to the planning inspectorate, Tesco have made a number of claims about the need for the proposed Express store and its accessibility by public transport. Some of these have been repeated, and none retracted, in their current application (08/0794/FUL). Councillors last night dealt yet another blow to Tesco’s plans for Mill Road when they voted to reject the latest application for air conditioning and refrigeration plant. The campaign was again allowed 10 minutes speaking time rather than the usual 3, in recognition of the level of public interest, and used the time to explain some of the many flaws in Tesco’s acoustic report. We pointed out, for example, that the measurements had been taken in the wrong place and some of the figures were inaccurate estimates (a point confirmed by the Council’s Environmental expert who was also present at the committee meeting). We also explained how the considerations of road safety and residential amenity, so crucial to the decision to refuse Tesco’s last application for an extension and plant, were also relevant here. Tesco had also provided no details of how they proposed to store waste, including the large amounts of rotting food that would be generated by the store’s operation. We had previously shown councillors photos of existing Tesco Express stores, proving how Tesco’s practice is to simply store all kinds of waste and delivery cages outside their small format shops. In her speech, Sonia Cooter, campaign co-ordinator, also reminded councillors of the importance of protecting the vibrant, diverse space of Mill Road. Other speakers against the application included Cambridge Friends of the Earth, Jannie Brightman, and a Lib Dem county councillor. Tesco chose not to bother to speak. After two hours of speeches and debates, councillors finally voted in front of a packed St Philips church to reject the application. 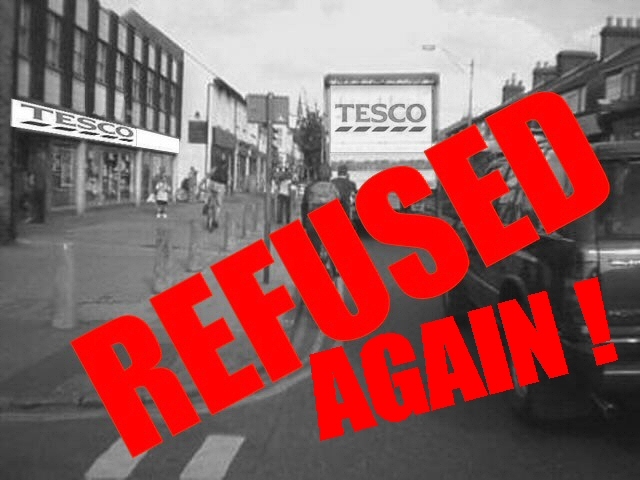 Tesco are now relying on overturning the previous refusal on appeal but don’t seem very confident they will win. Needless to say, we agree with them! You may have heard that this morning Tesco finally evicted the squatters from the Mill Road Social Centre; they had apparently booked the eviction a week ago, so were obviously confident of winning last night. Category: Press releases | Comments Off on Tesco defeated again!